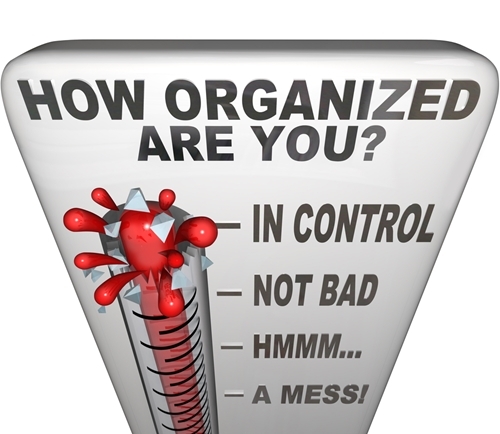 A majority of business managers believe that staying organized is a key tenet to success. By decreasing clutter and improving operational efficiency, an individual and a company is better able to boost production and decrease distractions. The National Association of Professional Organizers believes in the power of organization, which is why it aims to help businesses and individuals increase order and efficiency with key practices. Organization professionals and other managers can renew their dedication to efficiency by celebrating National Get Organized Week. This event is promoted by NAPO and has been held during the first full week of October since 1992. National Get Organized Week was created to promote the benefits of getting organized and the various tools and techniques that are necessary to achieve this goal. Benefits like stress reduction, increased profits and efficiency come from investing in the tricks used to get organized. Managers and other business professionals who are interested in boosting their ability to stay organized may want to consider investing in promotional items. Many professionals find that keeping a small notebook calendar handy is the best way to stay organized. While smartphones have numerous applications that can perform this very function, there are proven benefits to writing something down. Penning a note can boost a person’s ability to remember an appointment or fact. A person can use personalized calendars like the Regatta Curve Pocket Pal® Calendar to keep important dates, names and responsibilities in easy reach. This promotional weekly calendar is durable and features pleasing aesthetic value with two tone soft leather and detailed stitching. A professional who wants to improve his or her ability to stay organized during the week will benefit from this tool. It’s not uncommon for a business professional to need various papers at a meeting to show potential clients or for personal review. An individual will need to store these documents in an easy-to-carry case to decrease the chance that anything gets lost. A manila or plain folder can help, but either of these options are hardly professional looking. Potential clients or business partners may feel that a worker is not ready for a job if the tools the person uses are lackluster and inefficient. In contrast, the Terrassa Ambassador Bonded Leather Portfolio is a professional-styled organizational tool that will allow an individual to keep his or her documents in order in a pleasing case. The portfolio is crafted from classically grained bonded leather made in Spain and is fully lined with high-quality fabric. Plenty of business professionals understand the frustration of having to carry a multitude of materials, documents and electronic devices with them as they travel to and from the office. An individual will find it hard to carry everything in his or her hands, yet most bags are not appropriately built to handle the diverse number of things needed for the job. Unique promotional products like the Cartagena Executive Briefcase allow a person to keep everything he or she needs handy, without looking cluttered or unprofessional. The executive-level briefcase has a full zip-top closure with a body made from durable nylon-trimmed leather. The interior features a main center compartment that is designed for a laptop and another two inner sleeve pockets and one zippered pocket. A professional will never have to worry about staying organized in the future with this briefcase bag.